Does More Blades Mean A Closer Shave? If you've read any of my shaving articles, you know I'm a big fan of the Gillette Mach 3 Razor. I've tried the Gillette Fusion before, but wasn't real crazy about it. Admittedly, I'm a creature of habit. So, when Gillette sent me a Gillette Fusion Power Razor, I decided to give it another whack. The design of the Fusion is similar to the Mach3, just kicked up a notch. It has the same "paintbrush" type of head, but this razor adds three more blades -- two on the shaving surface and one on the flip side. Is this really about the shave or is it about beating Schick? The Schick Quattro has four blades. Ahhh, but wait! 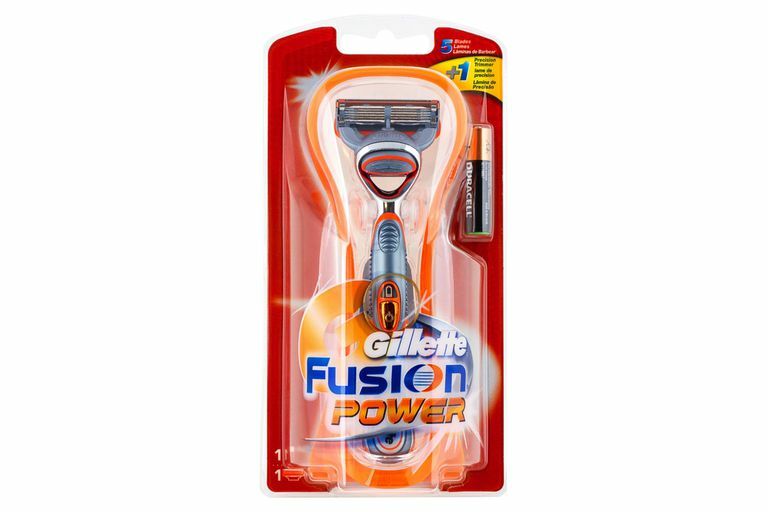 The Gillette Fusion Power Razor has six. Come on Schick, where's the Schick Septuplicate? I did not notice a significant difference between the closeness of my shave with the Fusion compared to my Mach 3 shave. The act of shaving was not as smooth as I experience with my Mach 3 and the Fusion felt like it was tugging a bit and the razor left my face slightly irritated -- something I don't experience with my Mach 3. Gillette claims the razor gives a more comfortable shave than the Mach 3 because the Fusion's blades are spaced closer together to reduce pressure. I find having two extra blades dragging across my skin causes some irritation -- like going over the same spot too many times. With any razor a light hand is the best approach. While I think, for me personally, the Mach 3 provides a more comfortable shave than the Fusion, the latter has some distinct advantages over its predecessor. The size and weight of the razor feels more comfortable in my hand than the Mach 3 and the sixth blade on the back of the cartridge makes trimming sideburns and shaving under the nose much easier. For both the Mach 3 and the Fusion, my biggest gripe has been that the head of the razor is too big for precision work and maneuvering in tight spaces. Gillette fixes this with the Fusion. From a design standpoint, I also felt the Gillette Fusion Power Razor's "micro-pulses" felt stronger than those of the Mach 3, so the razor glides more easily across the face. During the shave, the Fusion does feel smoother than the Mach 3. For those using a non-powered razor, this is really not a gimmick. The high-frequency vibrations do reduce razor drag and make shaving easier. The low battery indicator light and automatich shut-off are nice touches, too. Another factor to consider when purchasing the razor is cost. I've found both razors for around 10 bucks, but there is a much bigger gap between the cost of the blades. An 8 pack of Mach3 Blades will set you back around 13 dollars, while the Fusion blades will cost you around 19 dollars. Of course, I've been known to stretch the life of my blades, so the difference is not a huge issue for me. The bottom line is that I can highly recommend the Fusion to give you a close, comfortable shave. If you're using a Mach 3, you may not notice much difference between the quality of the shave, but the Fusion has the edge when it comes to design. Whichever razor you go with, just be sure to use proper shaving technique.